Is Grazing Ready for Cattle? 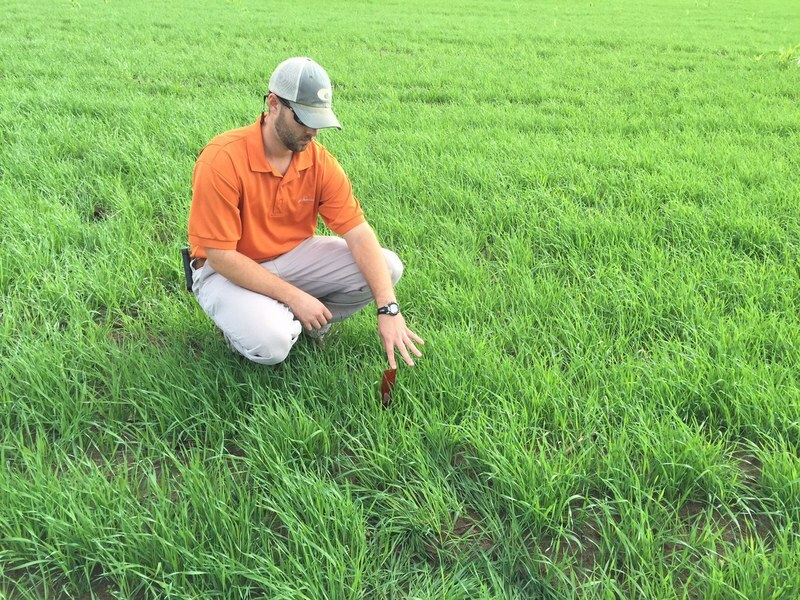 Here’s Decatur County agent Kyle Brown, as he and I were checking out this field of oats mixed with rye. We were measuring the height of the growth here to try to give the farmer some advice concerning when to let the cattle in to eat. 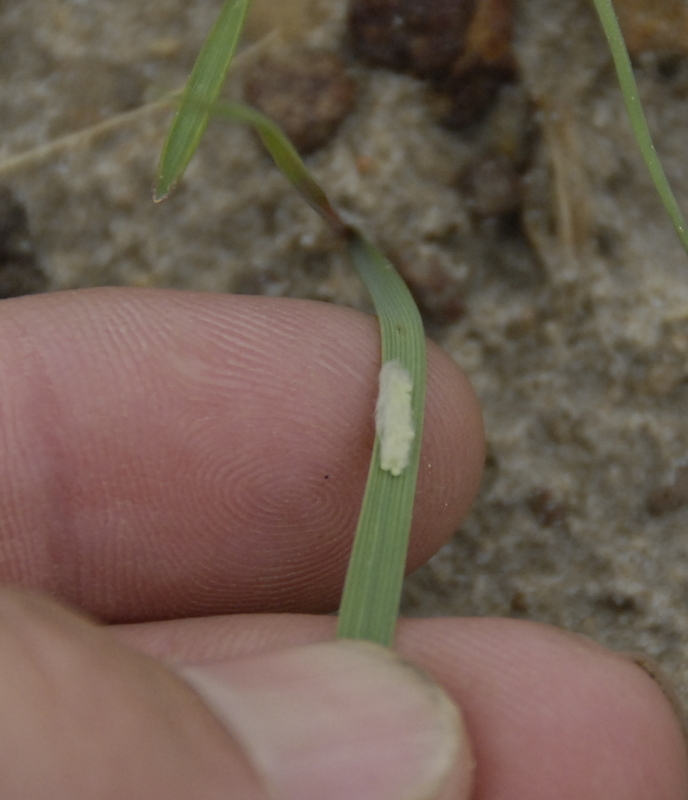 Here are some good thoughts from UGA Extension forage scientist, Dr. Dennis Handcock. Deciding when to let the cattle in is really where the “art” of grazing comes in. 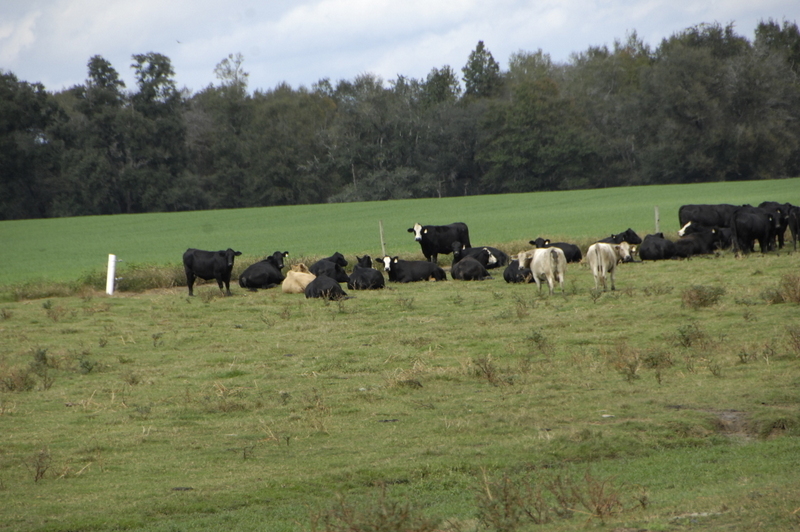 In general, the earlier one starts grazing, the more damage will be done to the pasture’s growth potential. It is a function of the growth curve. In that early stage (lag phase), when growth is slow or just beginning to get going good, grazing can essentially stop growth or slow it to a crawl. It is like a bank account with some principal in it. The more principal one has, the more growth in the account one will get. The growth rate is like compounding interest. Grass grows grass. Take away principal (grass), and the amount of growth will decrease. So, that’s enough professor talk… Practically speaking, one really shouldn’t start grazing until there is at least 1800-2500 lbs of DM/acre, though I would wait a little later on oats as they’ll slow growing in December (particularly if it becomes very cold). For rye, that would be about 5-6 inches. For ryegrass, I’d wait until it is at least 6 inches. For oats, I’d wait until it is about 6-8 inches. The ideal would be to only graze it a little… removing just what it’s average growth rate is and maintaining at least 1500-1800 lbs DM/acre. This is why I am a BIG fan of timed (limit) grazing. Remember… don’t be too quick to graze. Grazing too early can cost one more in the long run. Many cattlemen are having to feed more hay than expected due to poor establishment of winter annuals, poor growth of winter annuals due to cold/wet conditions, issues with Barley Yellow Dwarf Virus, leaching rains etc. Hay is hard to find. We are getting down to marginal to bad quality hay, so cattle feed supplementation is needed. 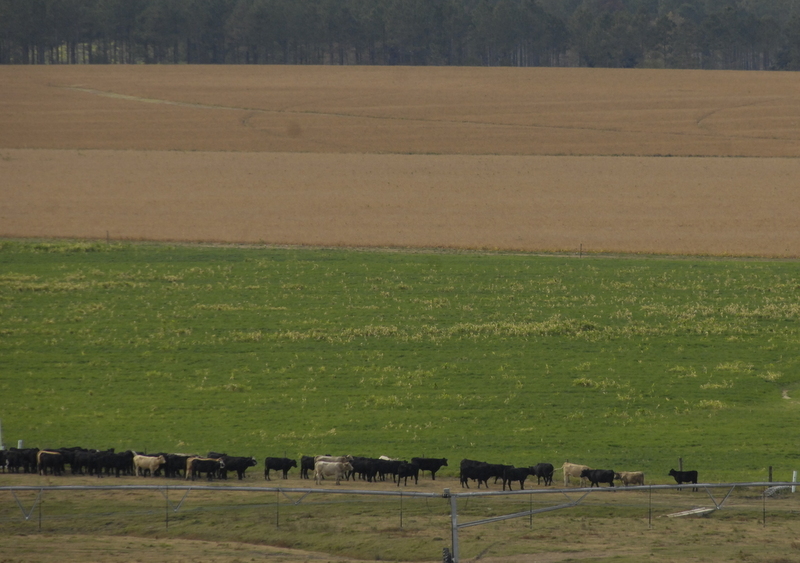 Here’s some information about supplemental feeding from UGA Livestock Scientists, Jacob Segers and Lawton Stewart. Most cattle producers are close to finishing calving (winter/spring calving herds), or in the later half of lactation (fall calving herds). 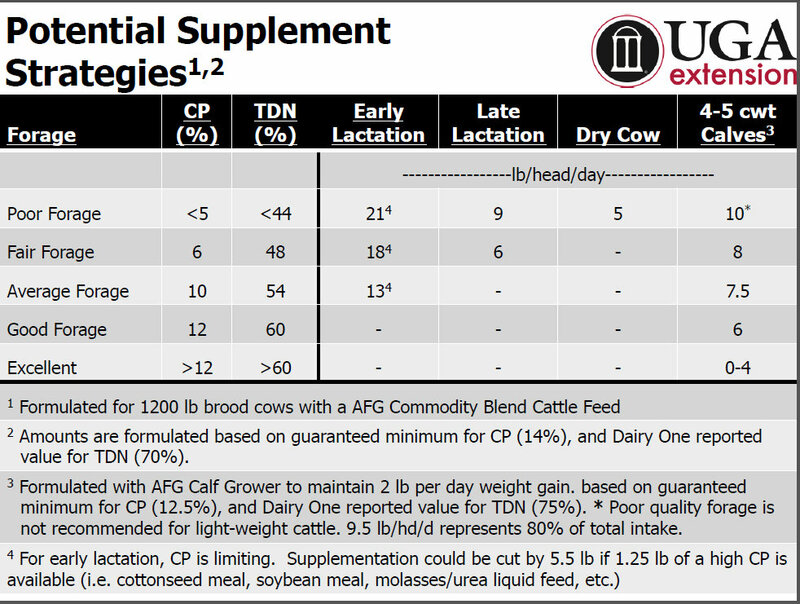 Considering the situation, we put together 2 tables of potential supplements for cattle/forage combinations. This first table is using readily available feeds from AFG Feed here in Donalsonville. The second table is for use with other feed sources. These are general and can be fine-tuned with a forage report and knowing the actual supplements available. 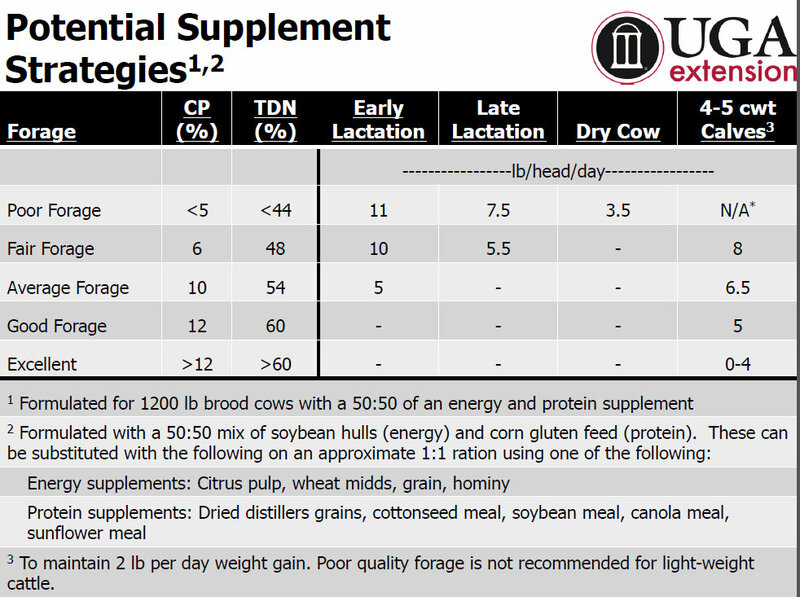 Most urea-based liquid feeds, blocks, and tubs should provide adequate nutrients if the suggested supplement is 3.5 lb/hd/d or less for brood cows. These feeds are not recommended for calves under 500 lb. 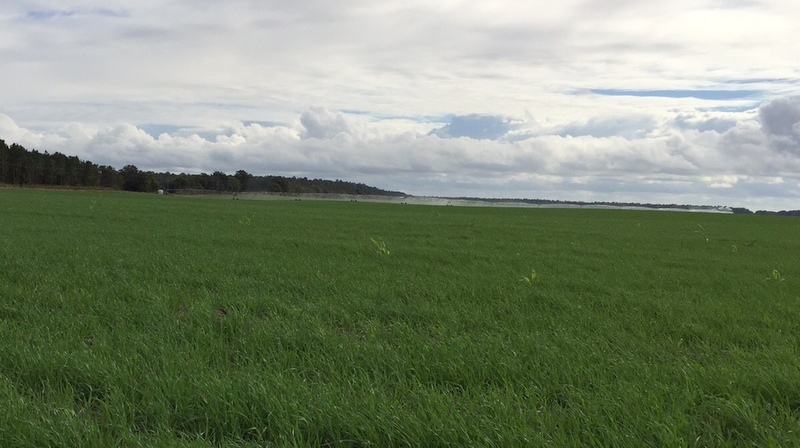 The UGA Georgia Forages program will host a workshop entitled “Alfalfa in the South” on Mar. 17 starting at 9 a.m. 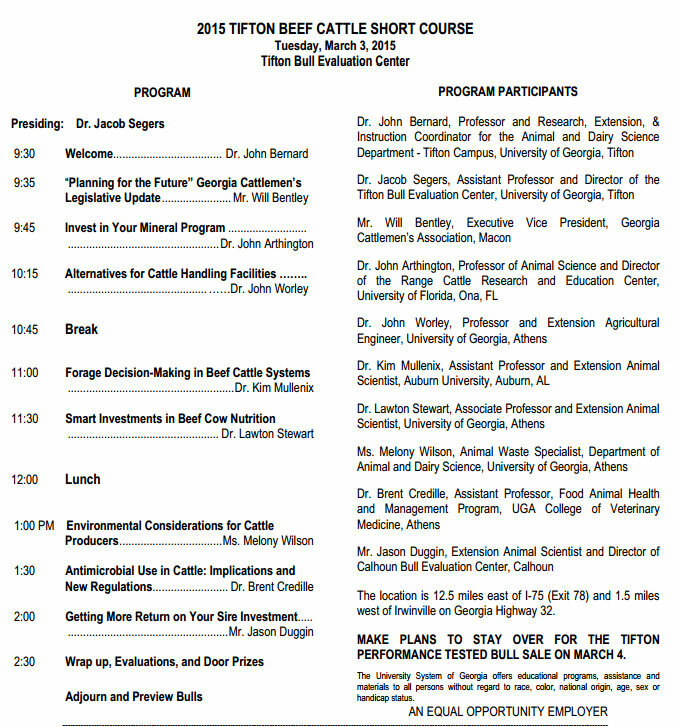 The workshop will be at the UGA Livestock Instructional Arena (2600 Milledge Ave., Athens, GA). The workshop will focus on how to successfully use alfalfa, including how to grow your own N and feed supplement by interseeding alfalfa into bermudagrass. Subjects covered include: site selection, establishment protocol, soil fertility, harvest management, and how to use this high quality and cost-effective crop. We will also have a grower panel to hear how other producers are using alfalfa in bermudagrass across Georgia and the Southeast. 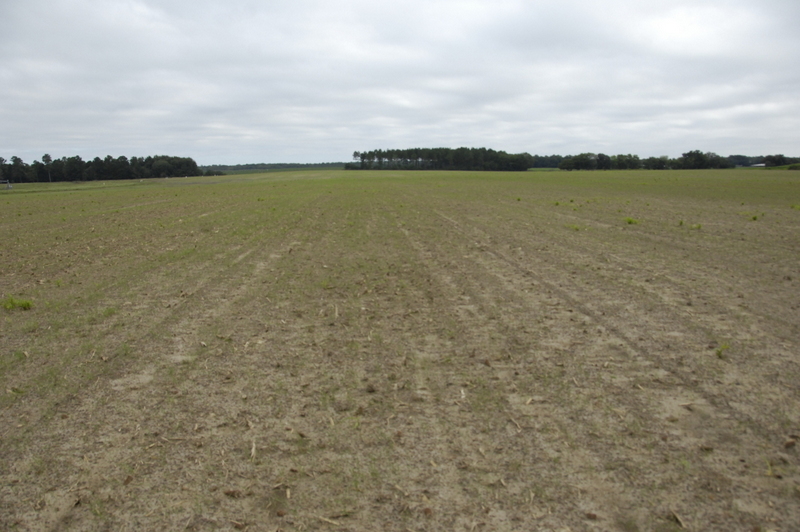 We then will go to see two fields where alfalfa was interseeded into bermudagrass (see full agenda). Cost of the one-day workshop is $25 and includes lunch and refreshments, an ‘Alfalfa in the South’ notebook, and other publications on alfalfa production and use in the South. To register, call Cathy Felton at 706-310-3464 or send us an email. (Note: Cathy is part time and works mornings. If you don’t get her, just leave a message and she’ll get back with you.) If you are interested in attending the workshop virtually, call Cathy Felton at 706-310-3464 or send her an email. Attending the webinar is free and you will receive all of the information via a pdf file. As we hunker down for a frigid cold snap in late February, we need to keep an eye out for issues with winter feeding programs. A potential perfect storm of events may occur over then next several days that can cause serious health issues and potential death. 1. Cattle (and other livestock) nutrient requirements are increasing. As many are in full swing of their winter/spring calving season, nutrient requirements for brood cows are increasing as they get closer to peak lactation. In addition, cattle consume more forage in cold weather to help stay warm. 2. Forage quality. The 2014-2015 hay crop was a major improvement from the previous year’s (see this summary). However, due to challenging winter annual production this year (e.g., very cold weather, major problems with barley yellow dwarf virus, too much rain washing N away, etc. ), in combination with hay supplies being low in many parts of the state, producers may rely on hay left from last year’s crop. We all remember the low RFQ issue we had with our 2013-2014 hay crop (on average bermudagrass hay was a little better than wheat straw). 3. Water intake. During cold weather water intake often decreases. Additionally, water may be unavailable for periods of time when temperatures stay at or below freezing for prolong periods due to water sources freezing. 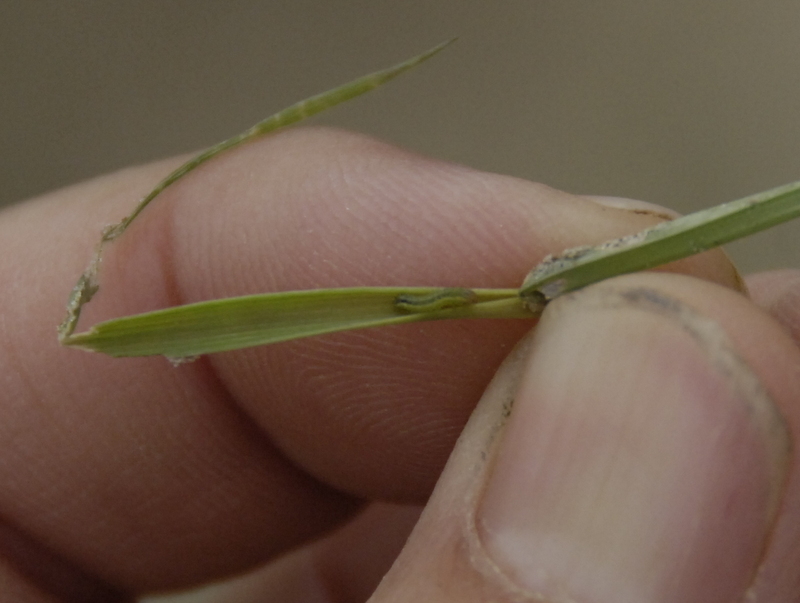 These events together can lead to impaction and starvation of cattle consuming low quality forage. Very similar to the problems we saw last year. 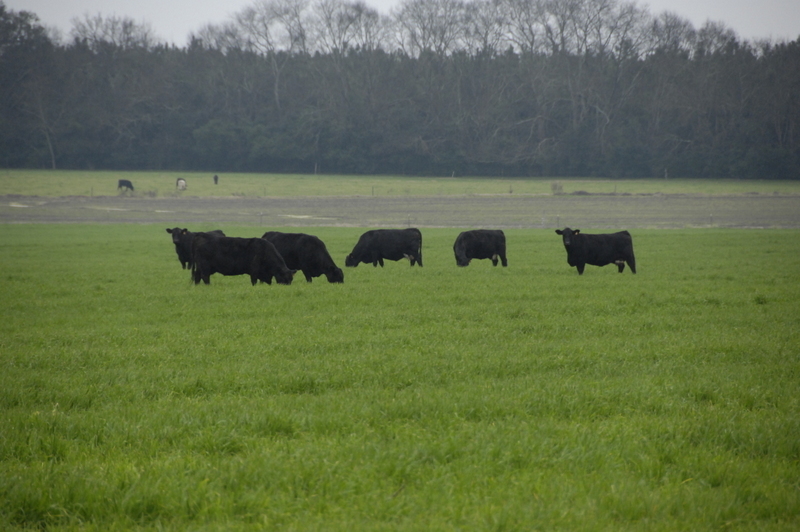 Dr. Lee Jones, Extension Veterinarian and Case Investigator with the Tifton Veterinary Diagnostic Lab, has received several cases and reports of beef cattle suffering from gastrointestinal impaction, similar to the severe problems that we had last year. Additionally, with the severe low nutrient content in some of the hay being fed, animals may literally starving to death, despite being full of hay. 1. Test hay. As with any nutritional situation, our best starting point is to know the nutrients we have available in our forage. This will allow us to effectively select a supplementation strategy to meet the brood cows nutrient requirements. 2. Explore other forage options. If other higher quality forages are available, such as winter grazing, baleage, silage, etc., consider utilizing or purchasing these. Although they may appear to be expensive, they may be more economical than other supplementation options. 3. Understand all supplements available. Fortunately, feed prices are relatively lower than in previous years. This should allow us more options for supplementation. Liquid feeds are an excellent tool, however DO NOT rely solely on liquid supplementation for lactating cows if forage TDN is below 50%. 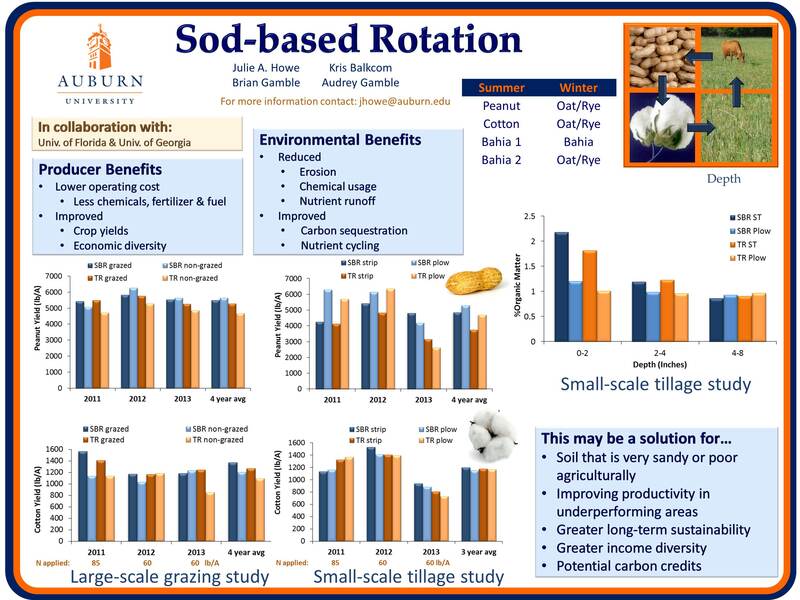 Dr. Jacob Segers and others put together a great pub on the situation last year: http://www.caes.uga.edu/commodities/fieldcrops/forages/documents/TP102_1.pdf. Sample rations for lower quality hay are outlined in this article. Here’s a good article dispelling myths concerning implanting cattle. January 28, 2015, Dr. Lawton Stewart , UGA Animal Science. If nothing else, I got you to stop and read this first sentence, or at least look at the figures. Implanting cattle is not a new technology, its been around for years. It has the potential to add 3-5% more pounds to your calf crop, yet fewer and fewer producers are employing the practice. WHY? Unfortunately, we as producers are faced with battling myths and urban legends about the food we provide. Although there is no science behind it, we are faced with the stigma of hormones in beef, and the resulting “natural beef” that many are producing to satisfy this concern. We figured now would be a good time to review what we know about implanting since we’re entering the time of year when winter/spring born calves are ready for this practice. What are implants? Implants are small pellets that contain a growth stimulant that is slowly released over a period of time. Implants work by increasing circulating levels of somatotropin and insulin-like growth-factor 1. These compounds are produced naturally by the animal and control mechanisms that regulate growth and feed efficiency. Implants are available for nursing calves, stocker calves and/or finishing cattle. Bulls calves intended for breeding stock and replacement heifers should not be implanted. Do implants improve performance? The simple answer is “yes”. A summary of several research studies revealed that implanting steer calves only once improved daily gains by 0.10 pounds per day, and implanting twice (the second implant would be administered 70-100 days after the first) increased daily gains by 0.13 pounds per day when compared to calves receiving no implants. This resulted in an average response of 5.3% increase in gain of calves at weaning for one implant, and a 6.2% increase for two implants. Does pay to implant? Again, the simple answer is “yes”. For example, assume an implanted calf on the cow gains and additional 5%. At weaning, a non-implanted calf would weigh 600 lb, so its implanted counterpart would weigh 630 lb. In today’s market, if we consider $2.00/lb value, that would add an extra $60 in value to that calf. All of this for an approximate input cost of less than $2 per head for the implant and the labor. Another way to look at it is that you would need to receive a $58+ premium for the non-implanted calf through a natural program to eliminate this technology. Is it safe for the consumer? Once more, the simple answer is “yes”. The public concern is focused on the increased estrogenic activity caused by the consumption of beef from an implanted animal. First, there is no such thing as “hormone-free beef”. 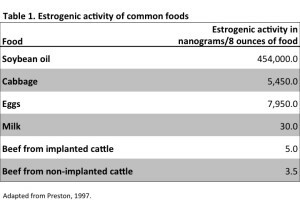 Hormones are present in all biogogical food sources, whether it’s animal or plant, implanted or not. Table 1 illustrates the estrogenic activity of common foods. This clearly shows the safety of this practice, as it applies to human health. So hopefully this helps explain the benefits of utilizing implants in cattle. There are several available commercially, and a specific applicator is needed for this practice. This article originally posted in the Southeast Cattle Advisor. There’s lots of good stuff to read there. The high cattle prices are tempting cowardly cattle rustlers. This warning below was released by the Ga Cattlemen’s association. It helps to know their modus operandi. “We want to make everyone aware that we (Ga Cattlemen’s Association) have been contacted by the Sheriff of Barrow County (it’s between Atlanta and Athens) today. He has had cattle stolen from farms in his area as well as cattle trailers. They are working with the Sheriffs in surrounding counties to catch the thieves. These guys are using catch pens to put the cattle in, then feeding them for a couple of days, backing up the cattle trailer to the fence, cutting the fence and the cattle are loading easily. As you well know, cattle prices are great and just a few cattle stolen can cost you greatly. We have seen this on the news for lots of states recently. We want to let everyone know that this is happening in Georgia. Please contact your local Sheriff’s office if you see anything suspicious. Monitor everything on your farm. If you see feed that you didn’t put out or the cattle around the catch pens then report it – report everything suspicious. If we all work together and look out for one another this can be stopped! Today I read this on the Drover’s Cattle Network and it sounds good. “The clock reads 5:30 pm, the kids are hungry, you have a pound of frozen ground beef and want to cook some burgers. So, how do you thaw the beef? This is a common dilemma as ground beef has increasingly become a staple in home cooking, and 62 percent of the ground beef consumers purchase ends up in home freezers, according to Shenoa French, director of innovation and product solutions at the NCBA. And, French says, about 44 percent of consumers leave the ground beef in its original packaging for freezing. Often, consumers do not think ahead to thaw their ground beef in the refrigerator as recommended, and in fact, about half of family meals aren’t decided until after 4:30 pm. You could use the thaw cycle on the microwave, but we know from experience that tends to cook part of the package before the rest is thawed and the result is undesirable. The culinary experts at the Checkoff-funded Beef Innovation Group (BIG) recognized this as a challenge and a barrier to consumers eating more beef, so they set to work on finding a solution, which French demonstrated to a group of trade journalists this week. The solution is surprisingly simple and effective. Here is how to do it. Remove your pound of frozen ground beef from its over-wrapped supermarket package (or from your own packaging if you repackaged it in a freezer bag). Place the beef in a one-gallon microwave-safe plastic storage bag, and zip the bag shut, leaving a small, pencil-sized opening at one end. Place the bag on your microwave turntable and set the oven to run for one minute on high. After one minute, remove the package and massage the beef to begin breaking it up. Turn the beef over, place it on the microwave turntable and run for one more minute on high. If needed, depending on the wattage of the microwave, turn the package over one more time and microwave on high for 30 seconds. The beef in French’s demonstration was thawed and crumbly, but still cold, with no cooked edges or liquid seepage after the two one-minute cycles. It easily could have been used to form hamburger patties or for any other ground-beef cooking method. French notes this method will work with frozen ground beef packages of about one pound, as long as the beef is packaged flat, such as in the typical supermarket foam trays. The cylindrical ground beef chubs often sold at retail are not good candidates for thawing with this method as their thick profile will result in some cooking around the edges before the middle thaws. French also notes that freezing ground beef or other beef cuts in the original supermarket trays is not recommended, as the packaging does not provide a sufficient barrier to prevent freezer burn. The BIG culinary experts recommend repackaging one pound of ground beef in a quart-sized freezer bag, pressed into a flat rectangle about an inch thick. This packaging protects the product’s quality while allowing efficient use of freezer space and, if needed, a thawing process that takes just over two minutes.